Catholic bishops in Philippines have hailed news the Vatican's news that the late Mother Teresa is heading to sainthood saying her canonization can help teach more compassion about the poor to Filipinos. This is despite some criticism against her that accuses her of perpetuating poverty or carrying out her work to convert people, both ow which are denied by her supporters. "This is a great joy for us. She founded [charity] houses here and she exemplifies selfless service, which is an antidote to the corruption and greed in our country and in the world," said Novaliches Bishop Emeritus Teodoro Bacani. She has however, faced censure from nationalists in India who have accused her of carrying out her work to proselytize and also from other quarters for perpetuating poverty along with others about how she ran her charity. Working mainly in India, Mother Teresa is a national hero in Albania with the national airport named after her in the capital, as well Tirana's university teaching hospital and other institutions in the mainly Muslim country. In India the nun's legacy was called into question once in February when the head of the Hindu nationalist group Rashtriya Swayamsevak Sangh (RSS) sparked outrage when he criticized her intentions. "It's good to work for a cause with selfless intentions. But Mother Teresa's work had ulterior motive, which was to convert the person who was being served to Christianity," said RSS chief Mohan Bhagwat. "In the name of service, religious conversions were made. This was followed by other institutes, too," the nationalist leader said at the opening of an orphanage in Rajasthan state, the Times of India reported. Over the weekend in Ireland's Sunday Independent newspaper, columnist Carol Hunt wrote that evidence shows that Mother Teresa took pleasure in the suffering of the poor; "so why do we revere her," she asked. She cited the deceased critic of religion Christopher Hitchens and opined, "The about Mother Teresa, and the work her Missionaries of Charity continue to do, should not be hidden behind a misty-eyed romanticism. 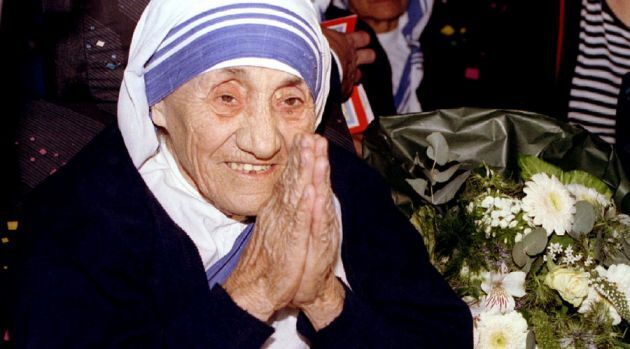 "Evidence - and her own words - show that Mother Teresa was not so much a 'champion of the poor' but a religious fanatic who took pleasure in their suffering. "Not only did she refuse to alleviate the pain of her patients but she gloried in it. As she herself said: 'I think it is very beautiful for the poor to accept their lot, to share it with the passion of Christ. I think the world is being much helped by the suffering of the poor people.'" Hunt asserts that Mother Teresa's famous 'Home for the Dying' in Calcutta "was deliberately kept as barren, destitute and inadequate to the needs of her patients as possible. "This, according to Teresa, was God's will. Even though the donations from wealthy patrons were enough to fund a number of world-class clinics, her patients languished in Dickensian poverty." Father Alexander Lucie-Smith, a priest and moral theologian, however, wrote a piece in The Catholic Herald decrying her critics in a piece entitled: "Mother Teresa was a saint on a revolutionary mission." He wrote, "Mother Teresa was, in her lifetime, and is, since her birthday into heaven, one of the best advertisements for Catholicism. "While we can expect in the months leading up to her canonization a renewal of the criticisms made by Christopher Hitchens and others, this should not bother us overmuch; indeed it is to be welcomed. "Hitchens and others disliked Mother Teresa for the simple reason that she was a Catholic. Any renewal of criticism will only serve to remind people of this important point." At the time of Mother Teresa's death the Missionaries of Charity based in Kolkata had nearly 4,000 nuns and ran roughly 600 orphanages, soup kitchens, homeless shelters and clinics around the world. Now the order sends nuns as missionaries to work in Albania. Malolos Bishop Jose Oliveros in the Philippines said the forthcoming canonization of the late nun was "great news" not only for the Filipinos but for the people all over the world. "Mother Teresa is a living image of God's mercy because she dedicated her life in the service of the poor and the abandoned. "Let us ask her to intercede that we may also be the bearers of God's mercy to those who desperately need his mercy," Oliveros said. Mother Teresa was born to Albanian parents in Skopje in what is now known as Macedonia as Agnes Gonxha Bojaxhiu in 1910. She was nicknamed the "saint of the gutters" dedicating her life to the poor, the sick and the dying in the slums of Kolkata, one of India's biggest cities, founding the Missionaries of Charity order of nuns there. She was beatified by then Pope John Paul II in a fast-tracked process in 2003, in a ceremony attended by some 300,000 pilgrims. Beatification is the first step toward sainthood. The miracle needed for her canonization revolves around the inexplicable cure in 2008 of a man in Brazil with multiple brain abscesses who, within a day of being in a coma, was cured, according to a report in Avvenire, the newspaper of the Italian bishops' conference. The Vatican deemed that his wife's prayers for Mother Teresa's intercession were responsible, the report said. Mother Teresa is expected to be canonized as part of the Pope's Jubilee Year of Mercy in 2016. "The Holy Father has authorized the Congregation for the Causes of Saints to proclaim the decrees concerning the miracle attributed to the intercession of blessed Mother Teresa," the Vatican said in a statement. In the Vatican's jubilee calendar, Sept. 4 is marked as a day dedicated to the late nun's memory and her canonization is likely to take place then, experts say.